Earn points for decorating, lose points for house fires. It was a dark time. It was a time of garment-rending and booze-drinking. Which, most of time, is a damned fun evening. But not so here. Tragedy. Like when the feeling’s gone and you can’t go on. So let me take you back. It was five years ago. A beautiful fall fall. And the beautiful fall fallness was shattered by…by…her. A villain of George R. R. Martin proportions. For those of you unfamiliar with The Pumpkin Tramp, well, who the hell are you and how did you get here? Ok..ok…for those of you unfamiliar with The Pumpkin Tramp, let’s just say that she’s Maleficent, Smaug, Voldemort and Candice Olsen all rolled into one Lori-Tormenting Hell-Neighbor. You may be wondering, if you’re not familiar with history, what she did to earn these invectives? Did she steal from me? Did she shave obscenities into one of the cats? Did she turn the ’96 Camry into a carbeque? No, my friends, none of those things. It was worse. Much, much worse. She destroyed my mental stability by annually installing a Halloween tableau of such charm that I couldn’t sleep, and that caused me to devolve into a plot-wielding, vandalism-imagining shade of my former self. 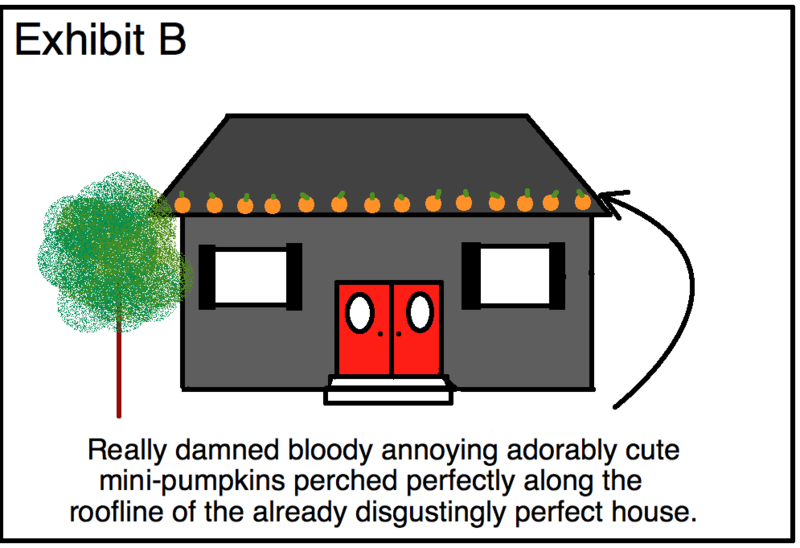 She put pumpkins on her roof. SHE PUT PUMPKINS. ON HER ROOF. And as you can see here in the historical record, she was able to do this by virtue of her flat, perfect for pumpkin displaying roofline. Leaving me no choice but to seethe and plot revenge. Ultimately, I refrained from putting any of those plans into action because we had a pretty active neighborhood watch program and I don’t look good in orange jumpsuits. And then, three short years later, was the proud owner of a house with a FLAT ROOFLINE. 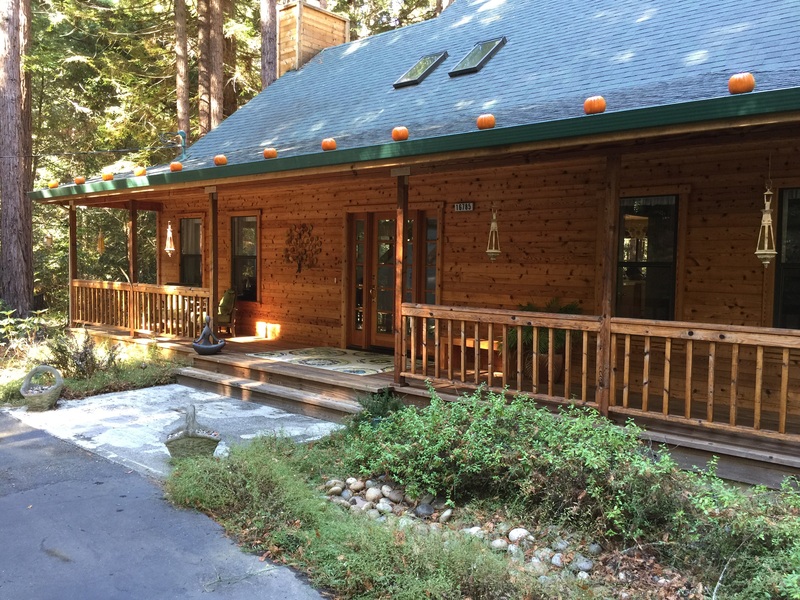 This was a major consideration not really a factor when purchasing the house. 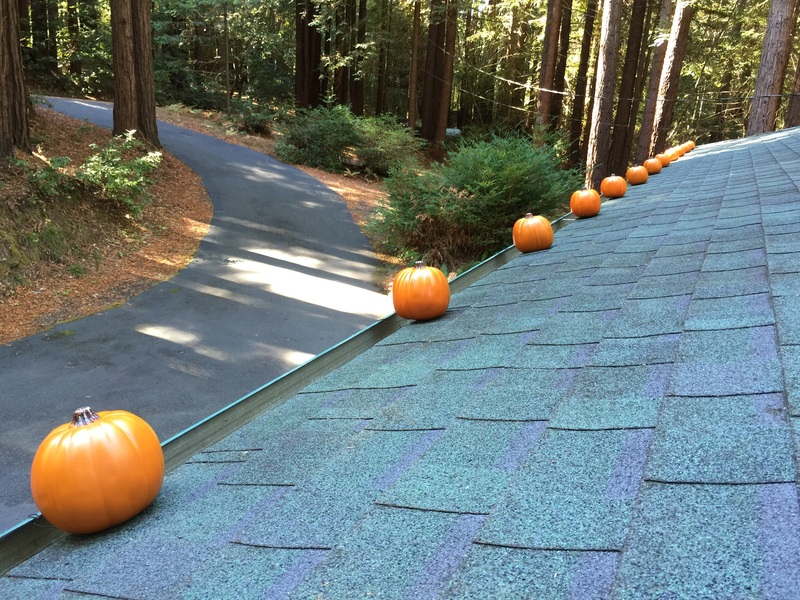 And it appears that Himself maybe really does love me as much as he says he does because he figured out a way to install the 13 Roof-Dwelling pumpkins on to a decidedly non-hypothetical roof. And so now, after playing the long long long game, I have my revenge. Is that not the most adorable thing you’ve ever seen? It’s so so so much better than the Pumpkin Tramp’s. You’re my favorite. I was hoping to see your pumpkins this year. Ahem. My pumpkins are on display for you any time. Ahem. Congratulations on your triumph (and for having a husband who would buy you a new house so you can have the roofline of your dreams). 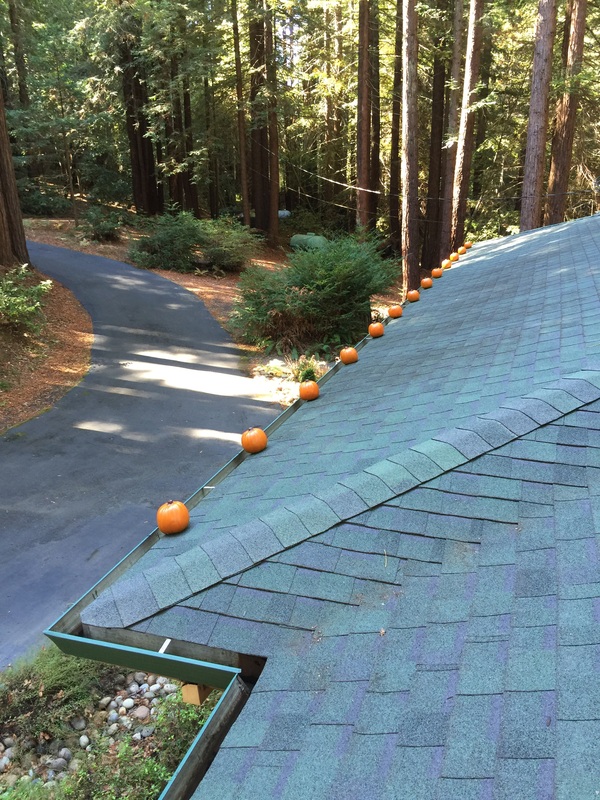 Not everyone has a husband who will install pumpkins on the roof. I’m very lucky that way. I love you and your pumpkins. Not a euphemism. Pumpkins. That porch. Pumpkins. THAT PORCH! !